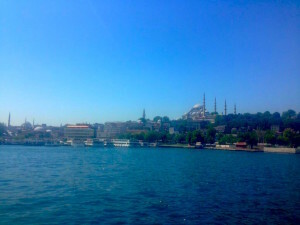 Following my fabulous sailing trip down the Turquoise Coast I managed to squeeze in a day and half in Istanbul. The last time I was in this fabulous city was over 5 years ago, and even though I’d seen most of the major sights I just felt the need to do some of them again. It’s one of those cities that I don’t think I can get enough of. These are my favourite things to do in Istanbul. The Bosphorus dominates the landscape in Istanbul. Not only does it divide Europe from Asia, but it’s also a lifeline for the residents and one of the best ways to get around the city. 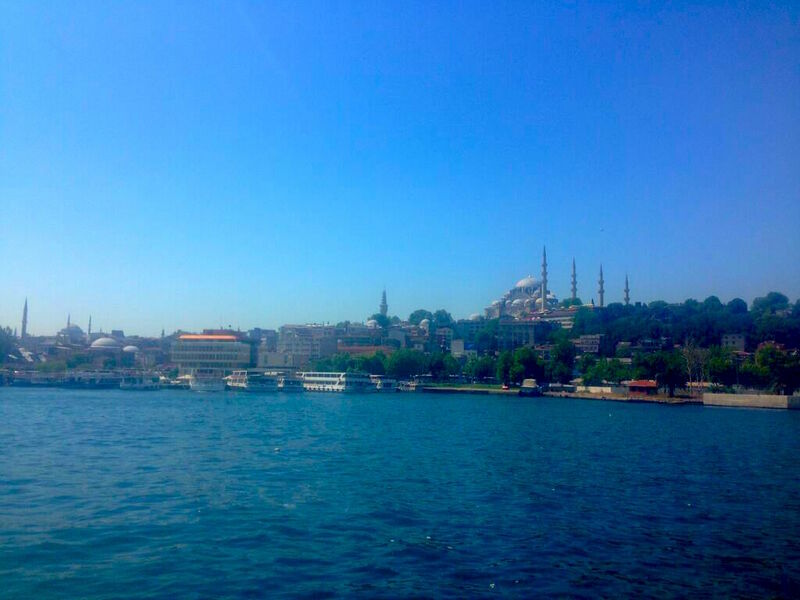 A ferry trip across the Bosphorus is almost manadatory for every visitor to Istanbul. Unfortunately I didn’t have time to take an extended trip, but my friends highly recommended visiting Princes Island for a day or even a week, I’ll have to do that next time. I’ve always been fascinated by Islamic architecture. The use of colours, intricate tiling and beautiful scripts are mesmerising, and Istanbul is like a treasure trove of the best. It’s impossible to see everything in just a day or two, but I managed to squeeze in quite a few Mosques and ancient buildings while I was there this time. Two I had seen before, being the magnificent Ayasofya and the Blue Mosque. While the Ayasofya was not originally a mosque, it was a basilica that was later turned into a mosque, it’s now a museum. It still has remnants of its history from intricate mosaics depicting Jesus Christ to the brilliant golden dome flanked by panels in Arabic script. Across the road is the Blue Mosque, grand yet restrained in its design. It’s minarets reach to the sky, but inside the detailed roof is muted in tones in caramel and teal. While it is beautiful, my favourite mosque this visit was the Sulemaniye Mosque. Positioned on one of the highest hills of Istanbul overlooking the Bosphorus, the Sulmaniye Mosque dominates the skyline. Unlike the Blue Mosque it’s decorated in an explosion of colour, from emerald to lashings of ruby and gold, it’s a joyous celebration of faith. Set amidst gardens, it’s also a peaceful place to spend some time contemplating life and the beauty of the city. My Airbnb was near the Kucuk Ayasofya (the little Ayasofya) so I stopped past for a quick visit. It’s a quaint mosque and a welcome relief from the busy crowds that feel like they’ve infested the rest of Sultanahmet. The Ayasofya has some spectacular mosaics from its Christian era, but they don’t compare to the hidden treasures that have been unearthed at the Great Palace Mosaics Museum. These mosaics were once believed to be the path of the Great Palace built by Constantine in the 4th century. While about 250 sqm has been restored here, it’s believed that the mosaics once covered almost 4,000 sqm. The scenes depicted blend the reality of every day life with flights of fantasy. Each mosaic is a work of art on its own, while also forming part of a larger story. The one that fascinated me the most was that of an elephant strangling a lion with its trunk. Being the gentle giants that they are, I was shocked to see an elephant depicted as a violent beast. A testament to the incredible feats of Byzantine architecture, the Basilica Cistern has to be seen to be believed. Located underground and believed to have been built in the 6th century, this once held 80,000 cubic metres of water supplying much of the city. The cistern is huge, about 65 metres wide and over 140 metres in length, it is supported with 336 columns. It’s a miracle that they have survived the elements to still support the ground above. At the back of the cistern are two columns that are held by huge carved medusa heads that have been turned on their side. Legend has it that these were stones from the Roman era that were turned around as a display of contempt. If the cistern looks familiar to you, it may be because James Bond wandered these hallowed halls in From Russia With Love. While the sights of Istanbul are wonderful, nothing compares to the experience of just walking through the Spice Bazaar and tasting all the sweet morsels on display. One of my favourite sweets in the world is Turkish delight or Lokum as it is locally known, so I was quite happy to make a meal out of it. The brightly coloured logs each had a distinct taste from sour pomegranate to rose covered in magenta coloured petals. A day or two is just not long enough to really see Istanbul. I left this time longing to stay for a few weeks so that I could get under the skin of this vibrant city. It’s now on a growing list of cities I’d like to live in some day. Until then, I can at least savour the lokum. Istanbul is so historic and rich in various things! I would love to visit it one day!